The best way to learn is by doing. 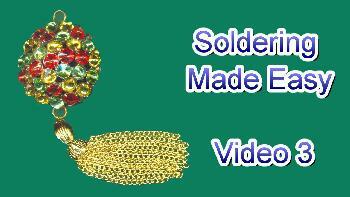 Each video is built upon soldering together a finished project that you will be proud of soldering together. 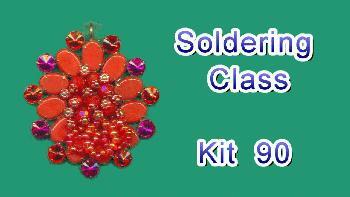 You will see in real time how to prepare the project for soldering and the steps to the completed project. The technique is what is important. 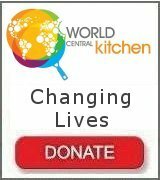 Please feel free to add your own touch of creativity to each project. 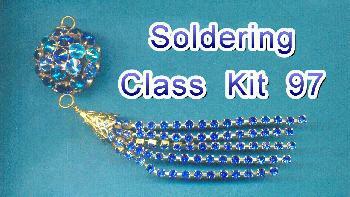 Jan's Jewelry Supplies offers a wide selection of Soldering Kits. 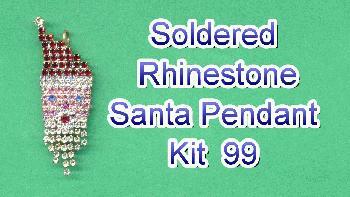 These kits contain the rhinestones, findings and settings to complete a project. The basic soldering techniques in this video will permit you to assemble and solder any of the Soldering Kits we offer. You see how to make the pendant pictured to the left. 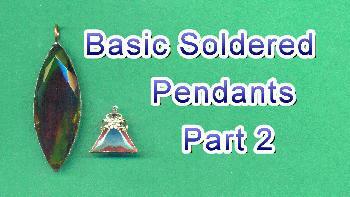 Video 2 builds on the soldering techniques in Video 1 and introduces the techniques required to solder a dapped (curved) pendant. The finished pendant is pictured to the left. Video 3 extends the technique we learned to make the dapped pendant in Video 2 to make a full round pendant by joining two dapped halves together. 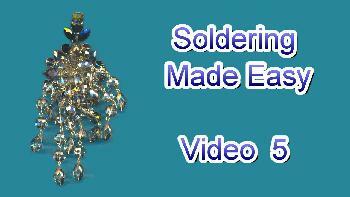 Introduced in this video is how to work with two different solder wires with different melting temperatures. The example full round pendant is pictured to the left. Video 4 offers another technique to make a dapped pendant by soldering a dapped piece to flat piece stacking the pieces together. The stacked pendant is pictured to the left. Video 5 introduces the technique of combining soldering and beading using a pronged screen finding as the base for a pair of large earrings. The stone settings are soldered directly to to screen and beaded chains are added to the screen to complete the project. The beaded earring is pictured to the left. How to solder pendants by wrapping a stone in copper foil tape and soldering the pendant with a soldering iron. 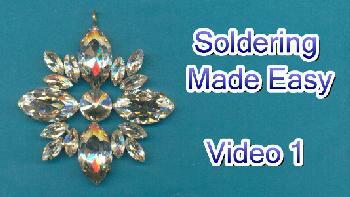 In this video a 19.5 mm transparent glass stone is wrapped in copper foil and soldered with a small filigree. In this video a 62 mm x 23 mm transparent navette glass stone is wrapped in copper foil and soldered with a soldering iron. A jump ring is soldered to complete the pendant. In this video you will learn to make an elegant domed rhinestone bracelet using rhinestone chain, 300 degree low temperature prefluxed solder and a heat gun. 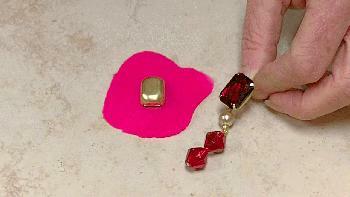 This video shows how to easily set rhinestones in a blank rhinestone chain. This is an advance soldering project and should not be attempted as a first project .In this video you will learn to make a rhinestone bangle bracelet using rhinestone chain, 300 degree low temperature prefluxed solder and a heat gun. 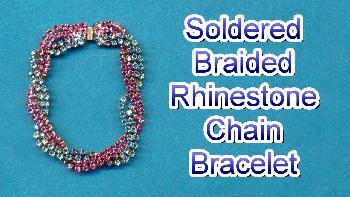 This video shows how to make a braided rhinestone chain bracelet using 450 degree prefluxed solder and a torch. 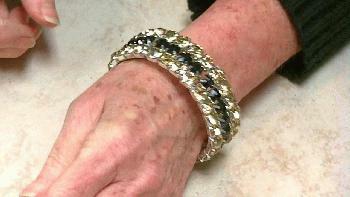 You will also learn how to solder a box clasp to the bracelet. It can be difficult to have a large necklace lay properly on you. The solution is to break the large necklace into parts and join them together using soldered shanks and jump rings. 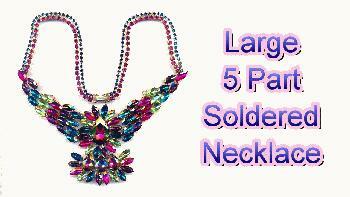 This video gives detailed instructions for joining a large five part necklace. 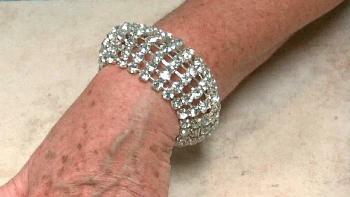 Step-by-step instructions on how to make a rhinestone bracelet with silver plated brass settings, 300 degree solder and a heat gun. Also learn to make a chain tassel and dangle. 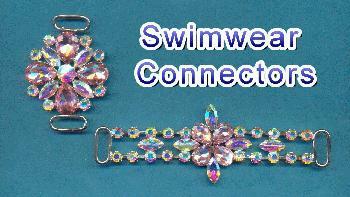 Easy to follow steps to make soldered rhinestone swimwear connectors with silver plated brass settings, rhinestone chain, 300 degree solder and a heat gun. Visit DeeZine Swimwear on Facebook. 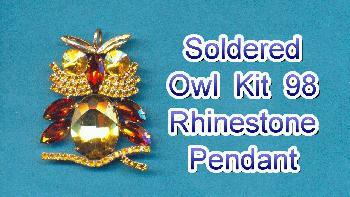 This soldering tutorial shows how to solder a cute rhinestone owl pendant with 300 degree prefluxed solder and a torch. This is an intermediate soldering project. 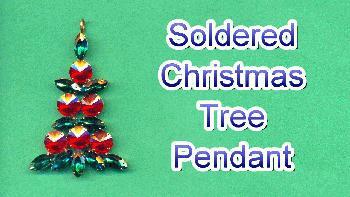 This video shows how to make a rhinestone Santa pendant using rhinestone chain, 300 degree prefluxed solder and a torch. 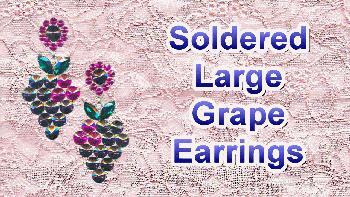 Learn how to solder these very large Grape Earrings using low temperature solder, silver plated brass settings and a heat gun. 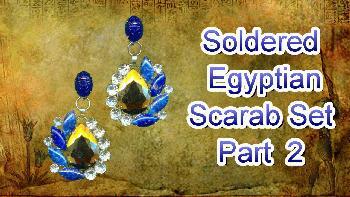 The Egyptian scarab bib necklace and earrings is one of my favorite jewelry sets. 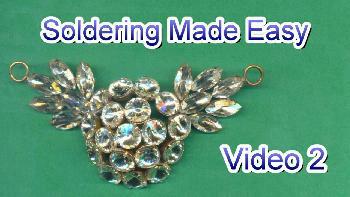 This video shows how to solder together silver plated stone settings and rhinestone chain using low temperature solder and a heat gun to make the bib necklace. 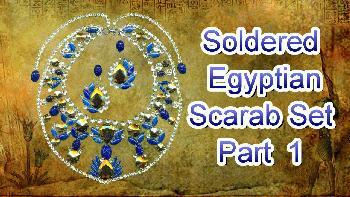 This video shows how to solder together silver plated stone settings and rhinestone chain using low temperature solder and a heat gun to make large scarab earrings. 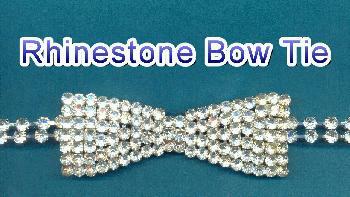 In this video you will learn to make a stunning rhinestone bow tie by soldering together silver plated rhinestone settings and rhinestone chain using low temperature solder and a heat gun. This bow tie necklace is made entirely by soldering together 28 ss rhinestone chain pieces using low temperature solder and a heat gun. This video shows three different techniques to solder posts or ear clips to the back of earrings. 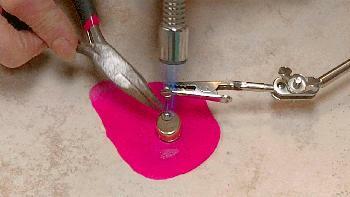 This video shows how to solder an ear wire to the back of an earring to make a dangling earring. The dangling earring is pictured to the left. In this video you will learn to make a pendant with a screen finding. 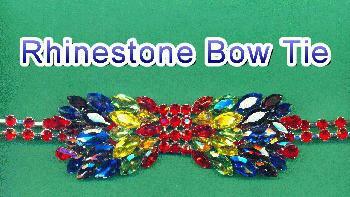 Stone settings are soldered to an oval screen and beads are attached to the screen. Pendant Soldering Kit 90, pictured to the left. 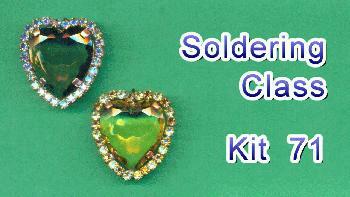 This video provides instructions to created a heart shaped pendant by soldering a rhinestone chain to a heart shaped stone setting. Pendant Soldering Kit 71, pictured to the left. 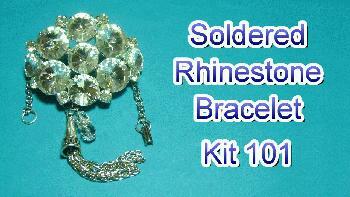 In this video you will learn to make a rhinestone chain bracelet by soldering together rhinestone chain and round settings with Rivoli rhinestones. Bracelet Soldering Kit 96, pictured to the left. 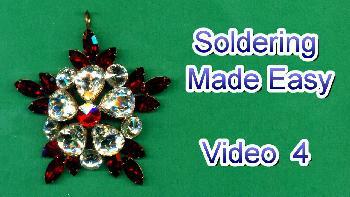 This video is a supplemental video for the Full Round Pendant in Jewelry Soldering Made Easy Video 3. Pendant Soldering Kit 97, pictured to the left.